I have to admit, it had been a while since I’d stopped into my favorite local cupcake shop, Starry Night Bakery and Coffeehouse. 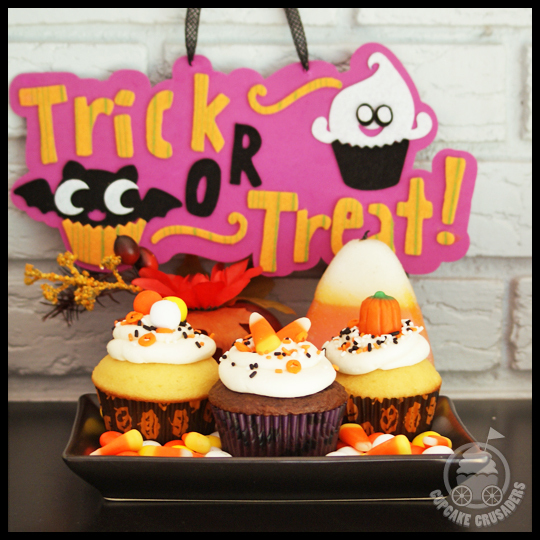 Cupcakes had been plentiful throughout the fall and sweets are never lacking at my house. But when they posted their new winter/Christmas flavors, I couldn’t stay away. I’m a sucker for new flavors. A push from Stacy, who wanted one or two for herself, didn’t hurt either. 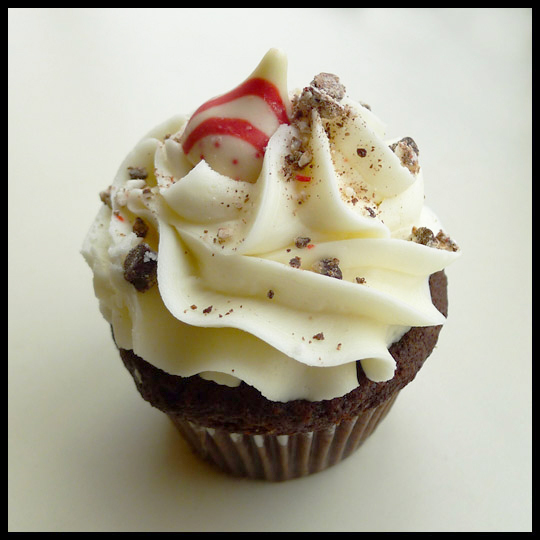 The White Chocolate Peppermint Mocha cupcake is the one that I couldn’t wait to dig in to. As soon as the little one was in bed for her nap, out it came. If you are a coffee lover like me, I’m sure just hearing the flavor combination is enough to make you swoon. The mocha and peppermint both came through, just like a well made peppermint mocha latte. Since Starry Night is a coffee shop, it’s no surprise that they know their coffee flavors. 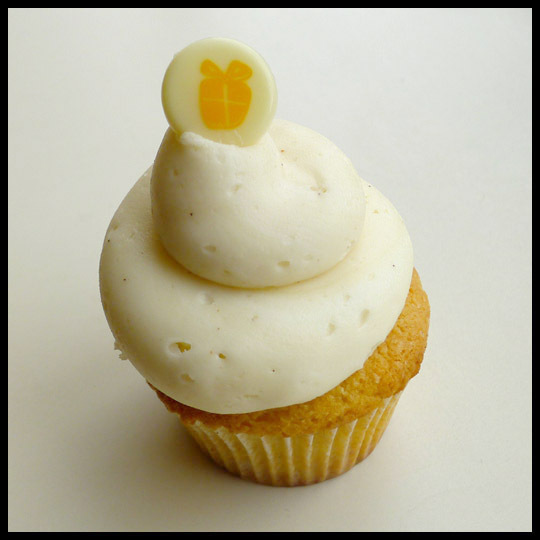 In fact, their coffee buttercream (which is also on their Mahoo Wahoo cupcake) is my all-time favorite. Unfortunately the white chocolate wasn’t present enough for me, but that could be because it’s a mild flavor and was overpowered by both the peppermint and coffee. It may have subtly balance out the other flavors though. Either way, the lack of white chocolate was clearly not a deterrent for me, as I’ve now ordered it two more times since. 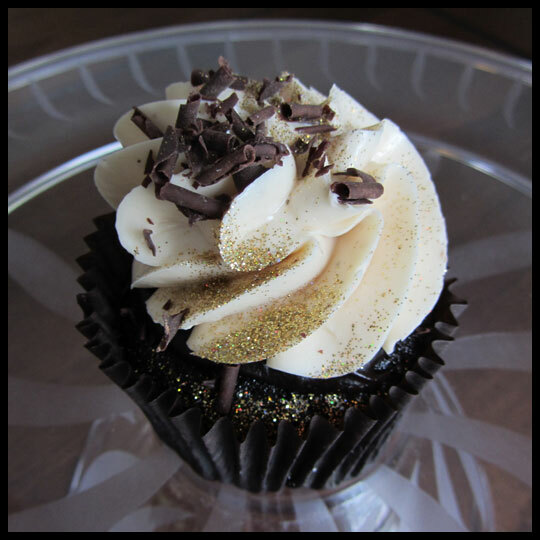 In addition to seeing a list of new flavors, Starry night also posted a photo of this cupcake in conjunction with a naming contest (“Peanut Butter Chocolate Time” won). Who wouldn’t want to try this bad-boy? Starry Night is no stranger to a peanut butter chocolate combination, but they are always mixing it up. This cupcake obviously stands out, with a Girl Scouts Tagalong cookie on top, but also has chocolate frosting AND peanut butter frosting, with peanut butter chips baked into the chocolate cake. My cupcake happened to have a clump of chips all in the center. I’m not sure it that was an accident or intentional, but it was delicious. And, as always, very moist cake and smooth frosting. 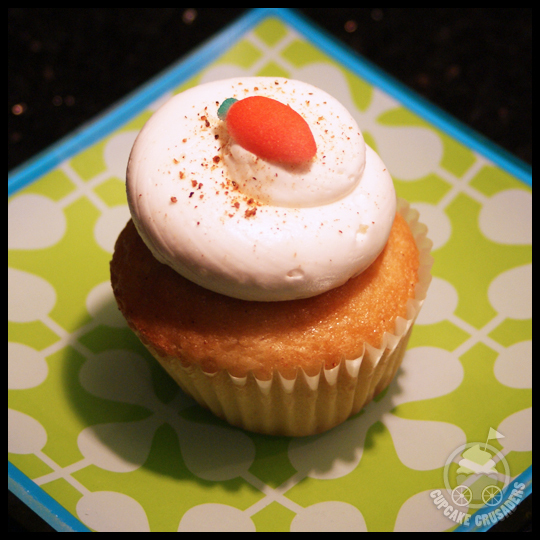 The worst part about the above Spiced Cider cupcake was that I had to share it with the hubby. After hoarding the White Chocolate Peppermint Mocha cupcake all to myself, I thought it was the nice thing to do (after all, ’twas the season for giving, right?). 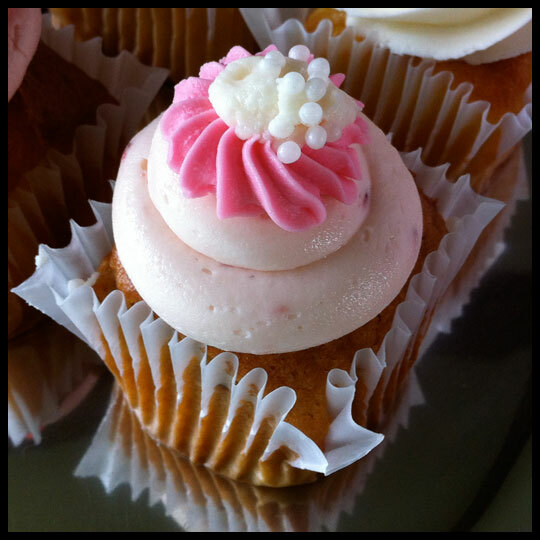 This cupcake had the aroma of a snickerdoodle cookie, with a spiced apple cake. The cake was baked with a generous amount of fresh diced apples and the buttercream was sprinkled with cinnamon sugar. 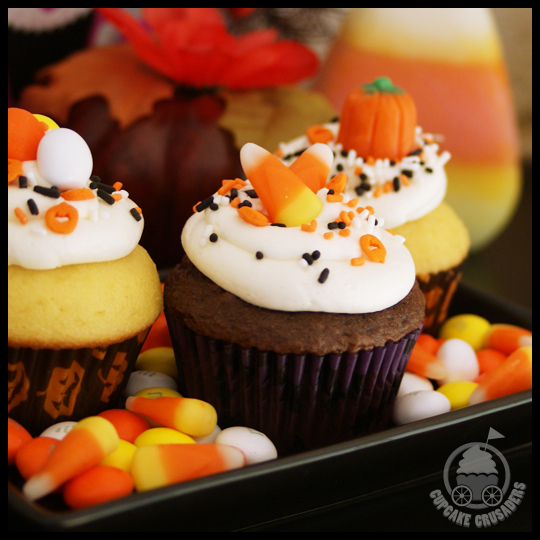 I’d be a happy girl if this cupcake reappears throughout the year. 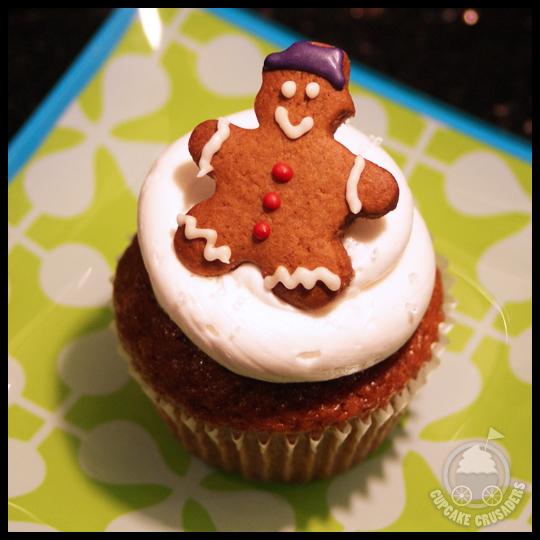 How can you not appreciate a cupcake with a tiny Gingerbread man on top? The cookie had the perfect spiced ginger flavor and consistency (not rock-solid like some). The cake also had the same, familiar spiced ginger “bite” which was mellowed by the sweet frosting, and the sugar crystals sprinkled on top add a nice crunchy texture. 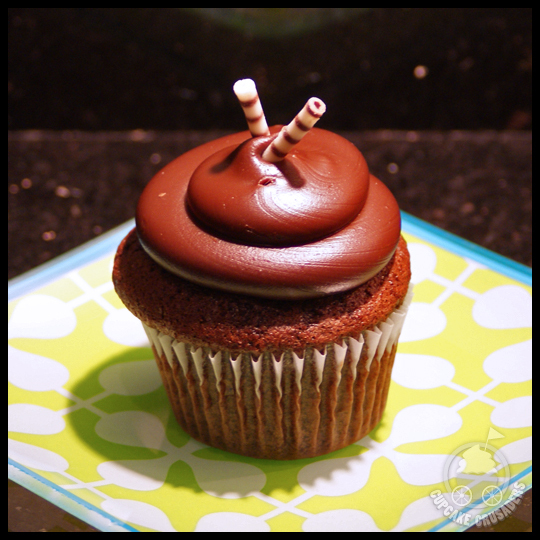 The cupcake above is called the Drunkin’ Elf, which is a chocolate bourbon cupcake with chocolate ganache frosting. 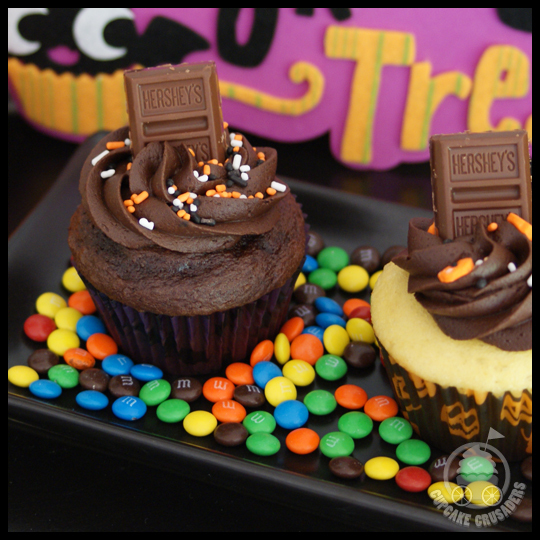 It’s chocolatey goodness paired with booze…’nuff said. 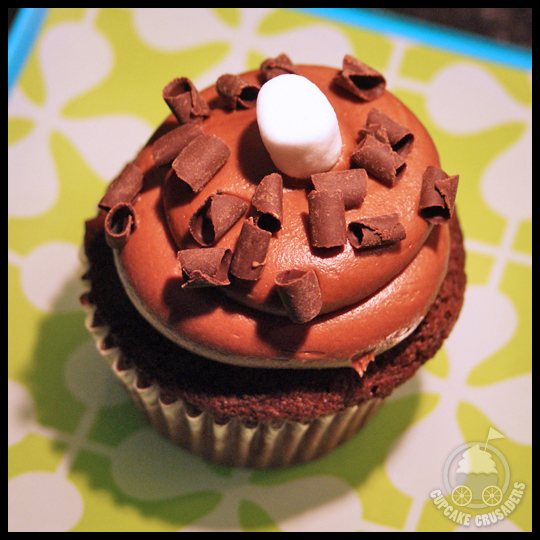 At a first glance, I thought this was another s’mores cupcake, but it’s really a Marshmallow Hot Chocolate cupcake. The chocolate cake is filled with a marshmallow filling, then topped with chocolate buttercream and garnished with a marshmallow and chocolate shavings. I was pleased with how the two flavors came through, without one overpowering the other. Eggnog isn’t for everyone. I can only handle it in small amounts myself, but there’s something about eggnog cupcakes that I love and this one was no exception. In addition to eggnog, it had a bit of spice (I’m guessing nutmeg) and I think even a hint of booze. 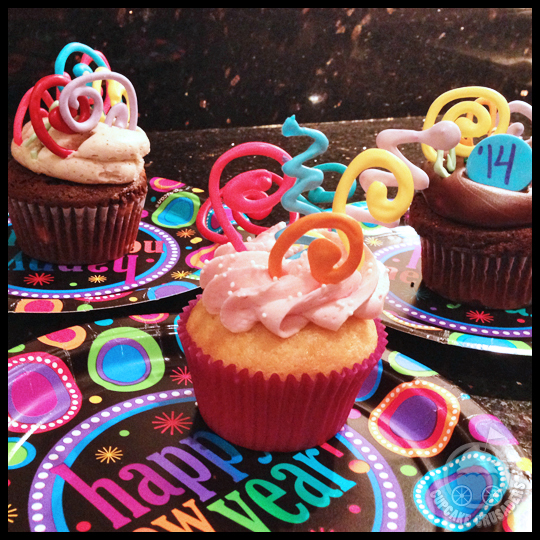 After such a successful tasting of all the winter flavors, I went back on New Year’s Eve. Last year my NYE cupcakes came from Starry Night, so now it’s a tradition. After talking with the owner, Shannon, she said that they’ll be keeping some of these flavors to offer throughout the season (and hopefully the year), but a couple (like the Eggnog cupcake) were only for the holidays. They are gearing up for new spring flavors in the next couple of months, so we’ll have to keep our eyes and ears posted to see what they come up with next! 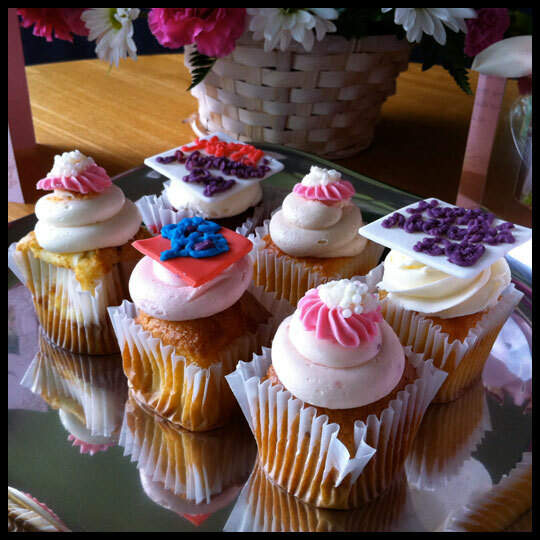 After our recent review of Sweet Hearts Patisserie, located in Annapolis, MD, we were contacted by the bakery asking if they could get a second chance. They really believed their products could get a better review and they were eager to have us try them out again. We are always open to trying a place again, when approached with a sincere effort to make things right. It shows a great level of customer service, which Sweet Hearts Patisserie had already proven they exhibited after my dad’s pleasant experience in their shop. Even if the second tasting didn’t go well, one thing we could vouch for is that Sweet Hearts Patisserie really appreciates their customers and honest feedback. However, after trying their cupcakes again and being much more satisfied, it made me wonder, can cupcakes (like people) have bad days? I was really excited to see the shop for myself. Photos online made them look like a wonderful shabby-chic getaway in the middle of a busy shopping center, and it was! Decorated for Christmas, I was stunned by the effort to make this shop stand-out. There were six cupcakes to choose from, so I picked four (we had already tried the Red Velvet and I wasn’t as interested in the French Vanilla). I was glad to see holiday flavors, so the Eggnog and Peppermint Chocolate were a no-brainer. Then the Pistachio (one of my new favorites!) found its way into my box of goodies. Since my dad would be tasting with me, and because it looked so good, we also got the Chocolate Silk. Back at my Dad’s house with our box of cupcakes, we decided we’d try the two chocolate cupcakes (he had no interest in the Eggnog or Pistachio). The chocolate cake on this cupcake was delicious! It was a heavier, moist, fudge-like cake, and yet still airy somehow. You can actually see how moist the cake was from the photo. The frosting was buttery, light, and smooth (just like our first experience), and rich in flavor. My dad said this was possibly his favorite cupcake ever! This cupcake had the same great cake as the Chocolate Silk, and the frosting also had the same texture. Unlike most places, which overpower your taste buds with peppermint flavor, Sweet Hearts Patisserie’s was subtle but still present. Another winner! My dad was still questioning if any treat for one person was worth $3.00, but then later that night he took my step-mom back and they purchased these two chocolate cupcakes. I think he must have decided that they were worth it! As much as I wanted to try all the cupcakes in one sitting, I wasn’t able to get to the Pistachio and Eggnog until the next day. The cake was on the dry side, similar to our first tasting, however the texture of pistachio chunks redeemed the cupcake (I’m a sucker for texture in a cake! 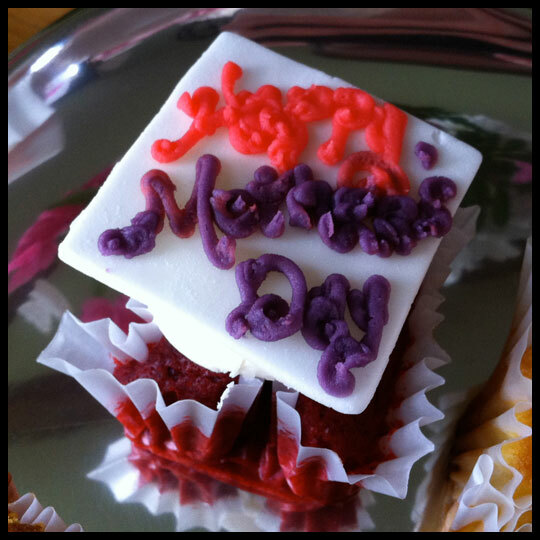 ), along with the amazing frosting. Sweet Hearts Patisserie should consider selling frosting shots, because it’s so good. 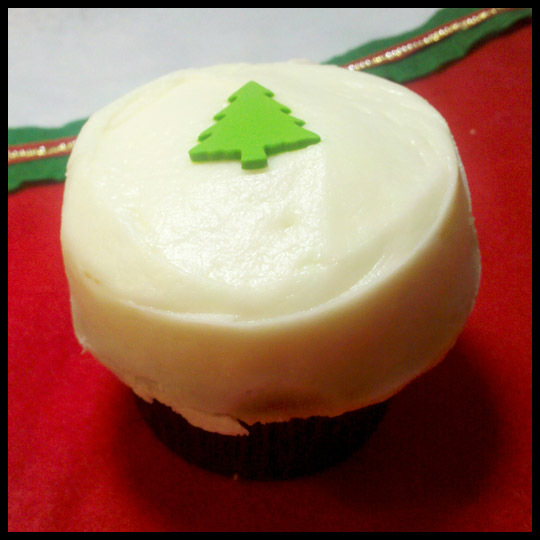 The cake on the Eggnog cupcake was moister than the Pistachio and had a great flavor, especially with the eggnog frosting. 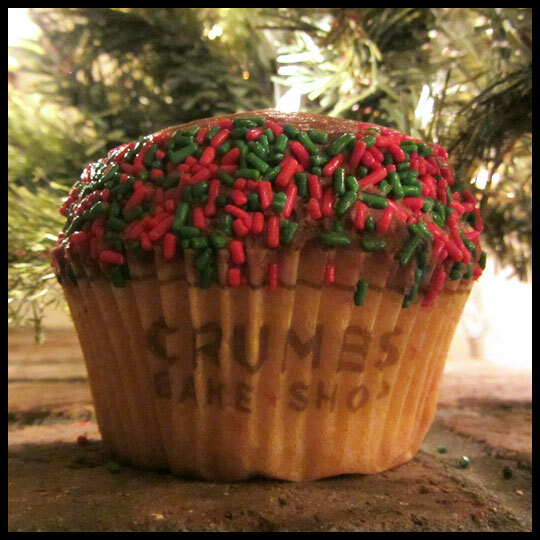 Any eggnog lover would appreciate this cupcake. 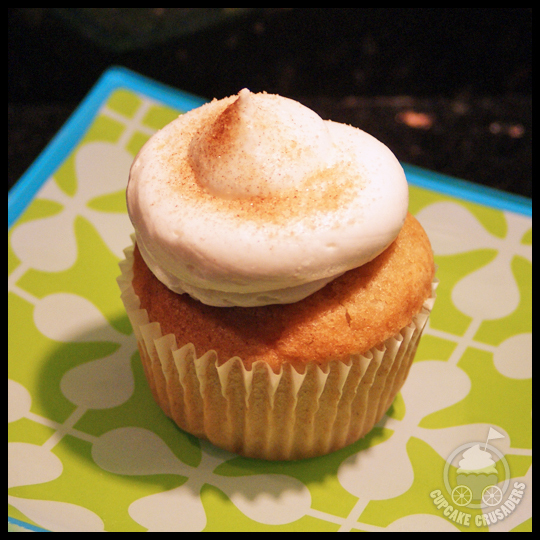 Actually, I like eggnog cupcakes much more than actual eggnog! Since Sweet Hearts Patisserie is a French pastry shop, I was really excited to try their macarons. There were so many to choose from! They are priced at $1.75 each, which is pretty reasonable for a French macaron. I choose four macarons, the Chocolate Chestnut, Lavender Honey, Raspberry Rose, and Eggnog. They all had a perfect texture: smooth, crunchy exterior with soft moist centers. 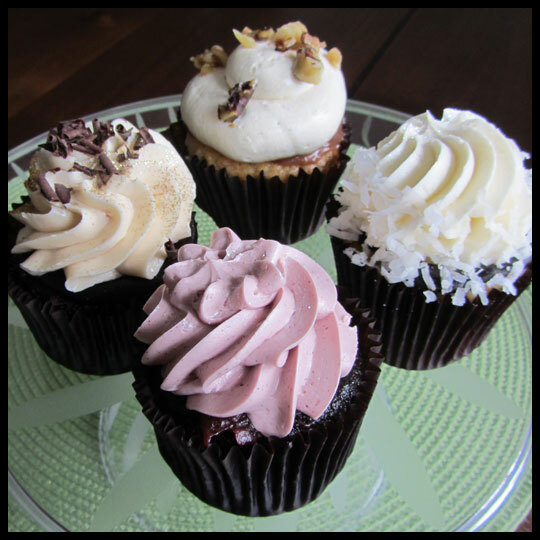 The Chocolate Chestnut had a nice nutty flavor, the Lavender Honey and Raspberry Rose both had subtle floral notes that didn’t overpower their complementing flavors, and the Eggnog tasted just like the Eggnog cupcake! Sweet Hearts Patisserie also specializes in petit fours. They are beautiful and I’m really curious about them, but at $2.50 each, that’s more than I want to pay for a bite size treat. 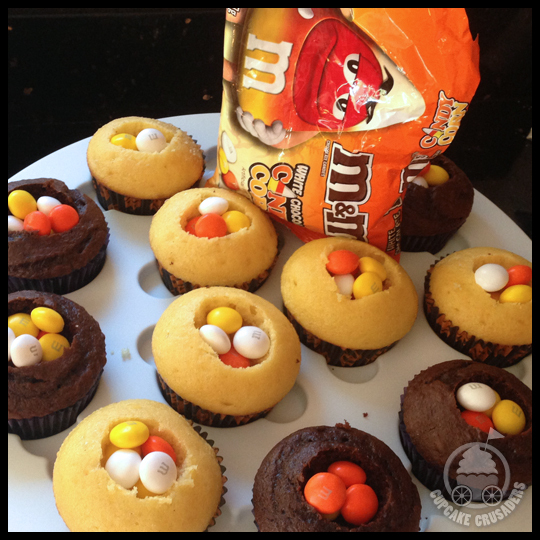 I know that they are usually on the pricier side and I can only imagine the amount of work that goes into creating them, but I’ll take a cupcake instead! However, if petit fours are your thing or you are looking for a special gift for a pastry lover, you should check them out (and then let us know what you think!). They are also offering a holiday menu with seasonal flavors assembled in cupcake, macaron, and petit four packages, plus cakes, tarts, and more. 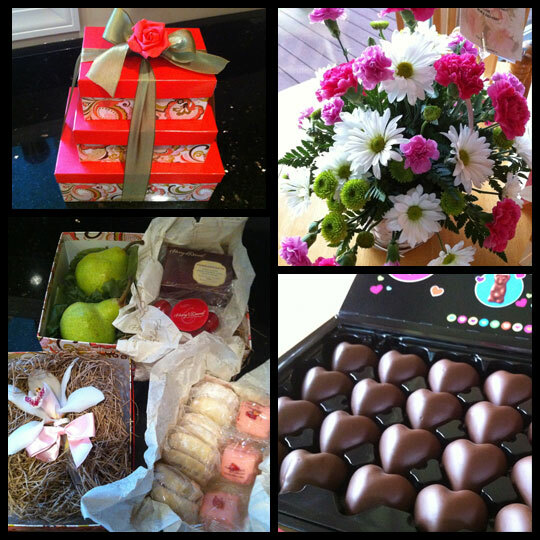 I am glad we gave Sweet Hearts Patisserie a second chance. 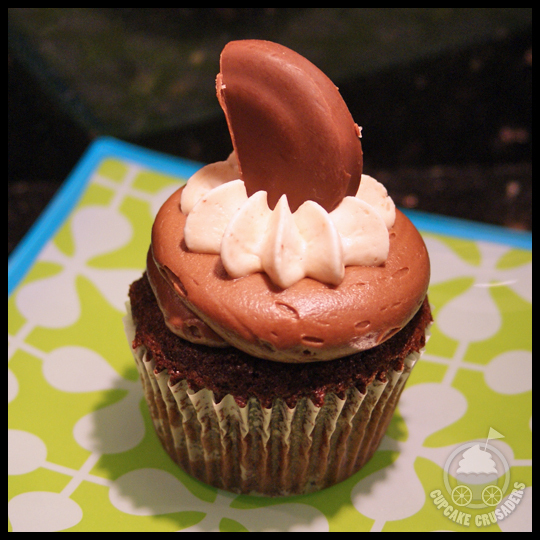 They are only a few minutes away from my dad’s house and they have the perfect cupcake to fulfill a chocolate craving. 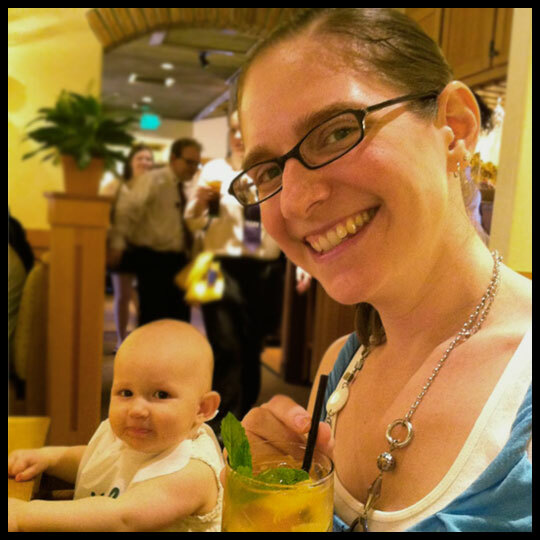 Have you ever given a place a second chance, to find that the product redeemed itself? Let us know! *Products were gifted, however this didn’t affect our opinions. When I saw that Flavor Cupcakery was doing their very own “Christmas in August” featuring their winter themed Cupcake Wars cupcakes, I knew this was the perfect opportunity to stop into their fairly new storefront in Cockeysville, MD. 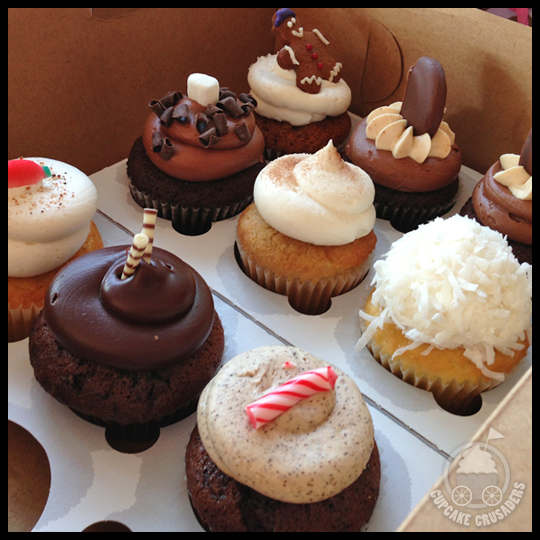 We visited their original location in Harford County last January (review here) but were only able to sample the one Cupcake Wars flavor they were offering at that time. All last week they carried one of the four different Cupcake Wars flavors each day but announced that on Saturday they would have all four. This was my chance to finally try the other three flavors! I already had a busy day planned for Saturday (my niece’s 3rd birthday) so I called their shop in advance and requested that all four flavors be set aside for me to pick up about 5:30pm, a half hour before their closing time. I didn’t want to take any chances that the flavors would be sold out and was happy they took my name and order over the phone. The new shop has the same feel as the original shop but is laid out a bit differently and seems a little smaller. Like the original shop, they carry cool cupcake merchandize and I spotted some new t-shirts I haven’t seen, but was able to leave with just the cupcakes I ordered. I credit this to the woman in front of me blocking all of the cupcakes and asking a thousand questions about each flavor and the attentive staff who asked if they could help me before I started grabbing any cute cupcake merchandize while I waited. Thank you inquisitive lady and friendly employee for helping me save some money. As soon as I was handed my box filled with treats, I instantly realized that the cupcakes had been kept in the refrigerator. I understand some fillings require refrigeration but I was really hoping it hadn’t dried these tiny cakes out. I placed these four cupcakes in an airtight container as soon as I got home, hoping to trap in whatever moisture I could so they would be as fresh as possible to enjoy with some out-of-town friends (including Guest Crusader Marina) who were visiting the next day. 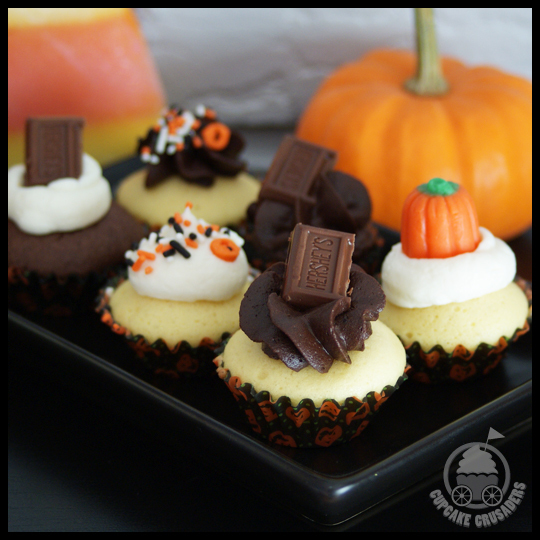 This cupcake consists of chocolate cake, a chocolate orange clove Grand Marnier filling, a spiced tea frosting, and is topped with chocolate/orange shavings. Although this cupcake was beautiful with its edible gold glitter, I think it had the most mixed reviews. Marina thought the clove flavor left a weird taste in her mouth, Jenn though it was just okay, and I really liked it. I love cloves so thought it brought a nice spiciness to the cupcake. One thing Jenn and I did agree on was the orange flavor was not present enough. In fact, I couldn’t really taste the orange at all. But if this was just a Chocolate Clove Marnier cupcake, it would have gotten an A+ from me. 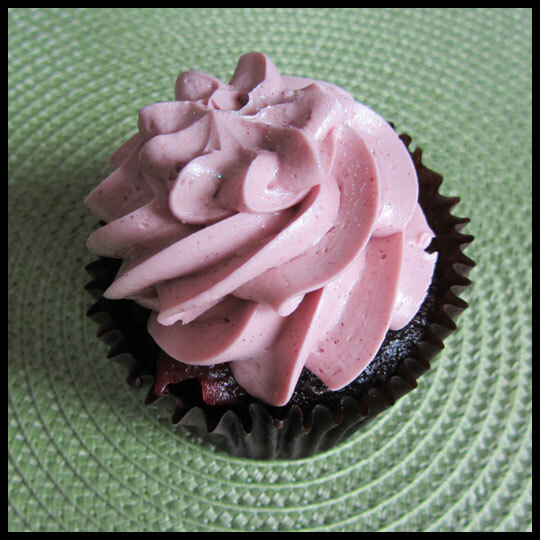 The group seemed most excited about this cupcake, with its chocolate cake, a spiced wine cherry reduction filling, and a wine reduction frosting. 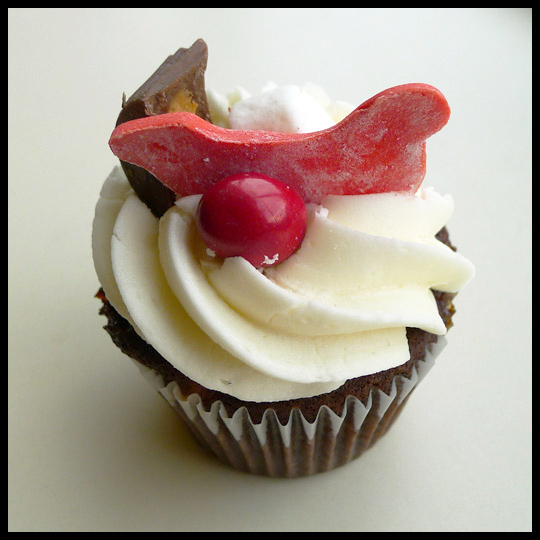 In theory this cupcake sounds amazing, but unfortunately we all felt that the frosting wasn’t sweet enough to blend well with the cherry flavor. Like all the cupcakes we tried that day, the frosting was super buttery and as a red wine lover, even I thought that it could use a little more sweetness. Crusader Elisa tends to prefer a more butter frosting though, so if she had been able to join us for this tasting, I think it might have been her favorite. 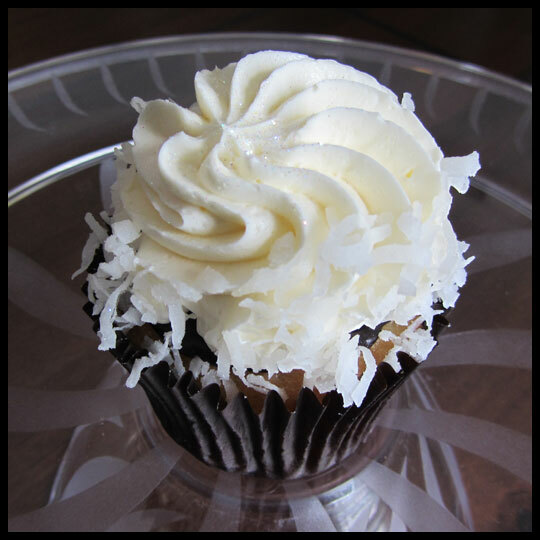 Only Kerry and I were excited to try this cupcake, comprised of an almond coconut cake, a chocolate ganache filling, a peppermint buttercream, and grated coconut on top. The cake was a bit crumbly so I ended up tasting that before taking a bite of everything all together. My first reaction was that it was really dense and sticky. I wasn’t sure how I felt about it until I tried it all together and then agreed with Kerry, this was a really good cupcake. Marina didn’t seem to dig the flavor combination, but Kerry and I really enjoyed it. I don’t think the combination of chocolate, coconut and peppermint is for everyone, but I look forward to having this cupcake again in the colder months. The one flavor we did all agree on was the Modern Fruitcake. This cupcake was just as good as I remember it being back in January, and luckily everyone else felt the same way. 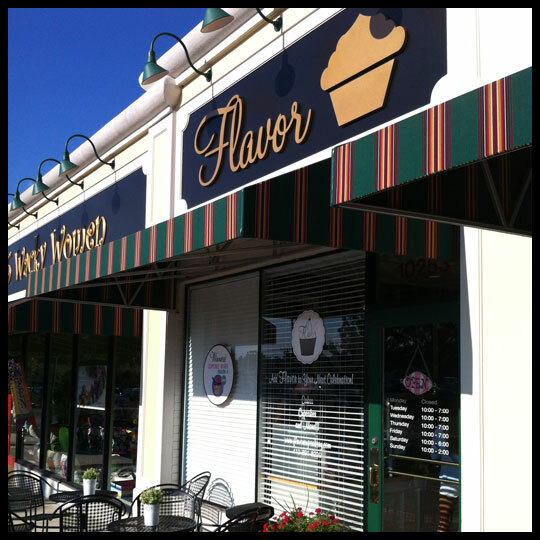 I’m still curious to try some of Flavor’s other cupcakes, like their Tiramisu, Pear and Goat Cheese, Raspberry Creme Brulee, and their Zucchocolate (Zucchini cake with either cream cheese or chocolate frosting – this is their August flavor of the month, and thanks to Ms. Questions I didn’t see it in time to add to my purchase…). With all these flavors on my must try list, I’ll definitely need to visit a few more times. 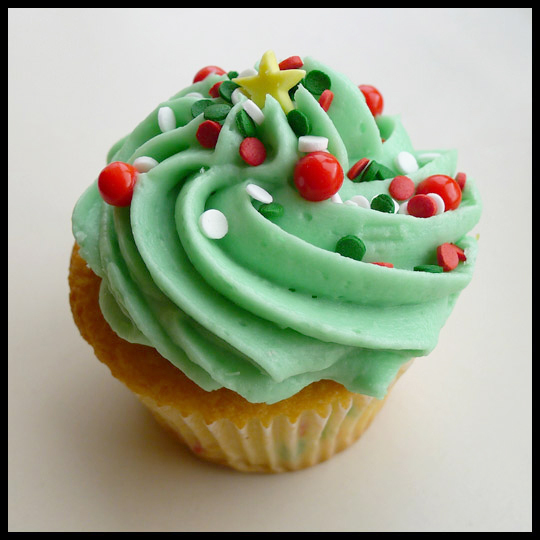 Throughout the month of December the Crusaders (and a friend of the Crusaders) have been gathering Christmas themed cupcakes to share in one big post. We hope you enjoy these reviews as you spend these next couple of days wrapping presents, baking, and spending time with family. 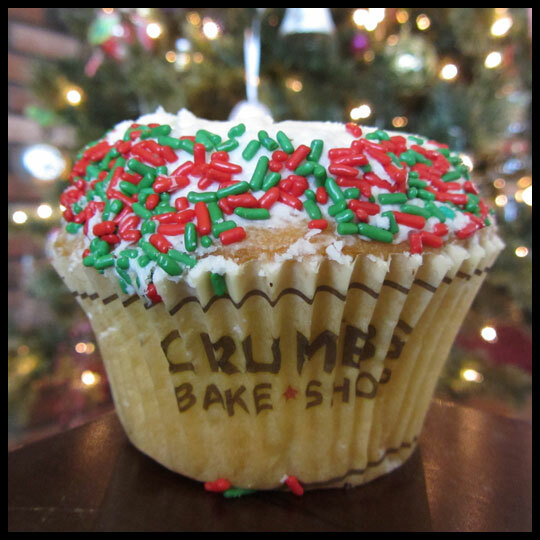 This year Crumbs had an assortment of cupcakes decorate and flavored for Christmas. Unfortunately, when Crusader Elisa and I stopped by they only had the following two, Vanilla/Vanilla and Vanilla/Chocolate with holiday sprinkles. We decided to go ahead and give them a try, since we haven’t had any of Crumbs classic flavors and we had waited in a long line. We were so glad we did! This cupcake blew me away! I’m still often pleasantly surprised by how good a vanilla cupcake can be. The cake was light, moist and very buttery. It brought back memories of the vanilla cake my mom used to make when I was a kid. The vanilla cream cheese frosting was the perfect compliment and it was double perfect because I ate half of this cupcake for breakfast. Vanilla is quickly becoming a favorite flavor of mine, which is still a bit shocking to me. The cake on this cupcake was exactly like the cake on the Vanilla/Vanilla cupcake. The frosting was just as light a fluffy as the vanilla cream cheese frosting, but the milk-chocolatiness of it complimented the vanilla cake perfectly. Unfortunately this was not a good cupcake. The cake was really dry and dense and there wasn’t much flavor to it at all. The frosting was just okay too. 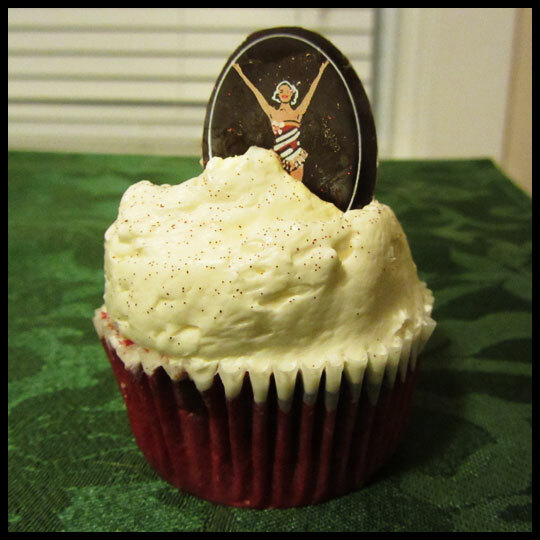 Unfortunately the best part of this cupcake was the edible glitter and the chocolate Rockette on top. One redeeming quality was that even with how busy they were, the staff was incredibly friendly, so we had a great experience while we were there. 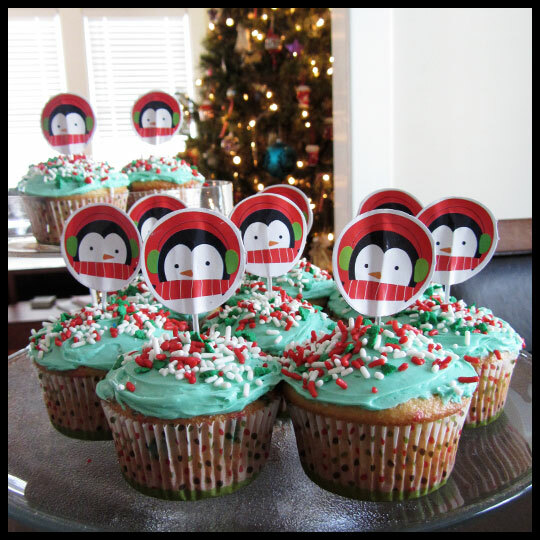 IcedGems has a huge assortment of holiday flavors and decorated cupcakes this year. 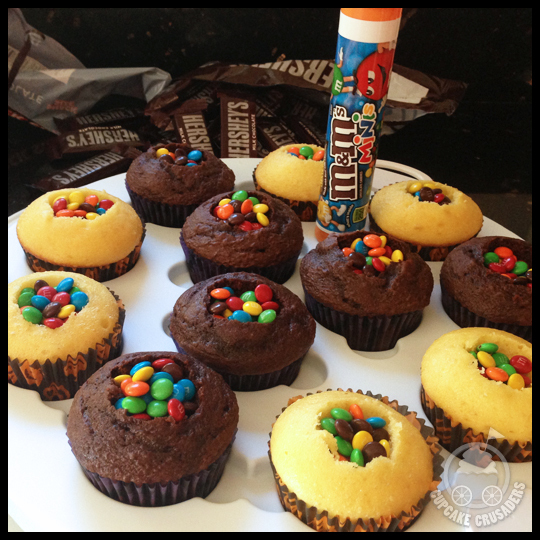 The options are amazing and thanks to one of Elisa’s co-workers – a fellow cupcake lover, Rebecca – Elisa has five to show you below. Thanks Rebecca for hooking us up with such awesome cupcakes! Chocolate, peppermint, Hershey’s Kisses… what more can you ask for?! 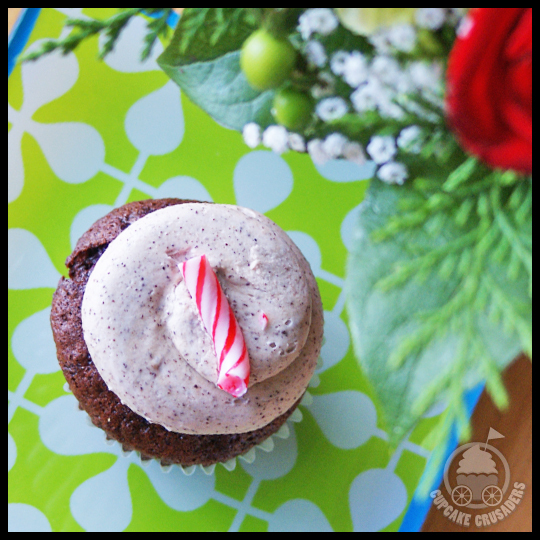 The perfect blend of sweet and peppermint, this cupcake made me go, “MMmmmmmmmm.” The cake was moist and rich with flavor, while the icing was smooth, creamy, and unfolded a peppermint taste on your tongue. Find their truck and buy one of these asap! This was their “birthday cake” cupcake, which is fun-fetti cake with sweet buttercream icing. 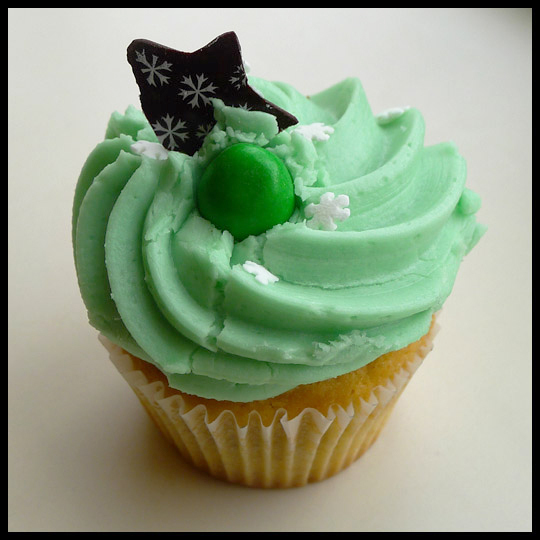 With it’s adorable star on top, this cupcake screams Christmas cheer! It was moist, delicious, sweet, savory, and just plain yummy. Simple flavors sometimes get lost in the mix of extravagant, complex, flavors, but this one was a shining star! This adorable cupcake was very moist and sweet. It was a peanut butter swirl cake with vanilla buttercream icing. Elisa said that while it was really good, it wasn’t her favorite, but that there was some pretty steep competition with some of the other flavors. This chocolate cupcake was very good. 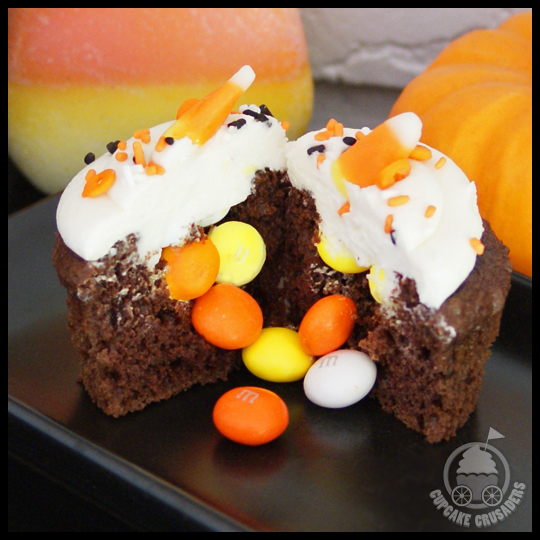 With Santa’s legs sticking out of it like he’s stuck in a chimney, the flavorful cupcake was a sweet treat – with it’s reese’s peanut butter cup and marshmallow on top, this cupcake wasn’t just fun, it was flavorful too! 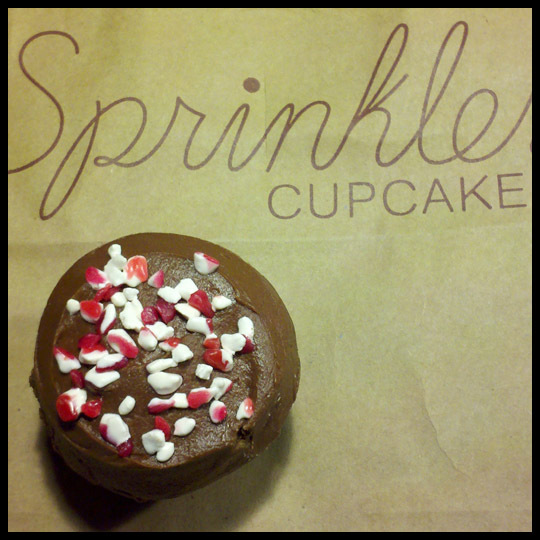 Another big “THANKS!” must go out to our newest Guest Crusader, Rebecca, for bringing a Red Velvet Sprinkles Cupcake to Elisa and sharing a review of the chocolate peppermint she got for herself. We hope whether you are baking cupcakes or ordering them from your local bakery, that you and your family have a very “sweet” Christmas. Bring on the Holiday Fun(fetti)! He’s cute, right? When I saw this cupcake topper and liner set while out doing some Christmas shopping at Target, I couldn’t resist getting it. I had already purchased what I thought would be my holiday cupcake liners, but these were far cuter. 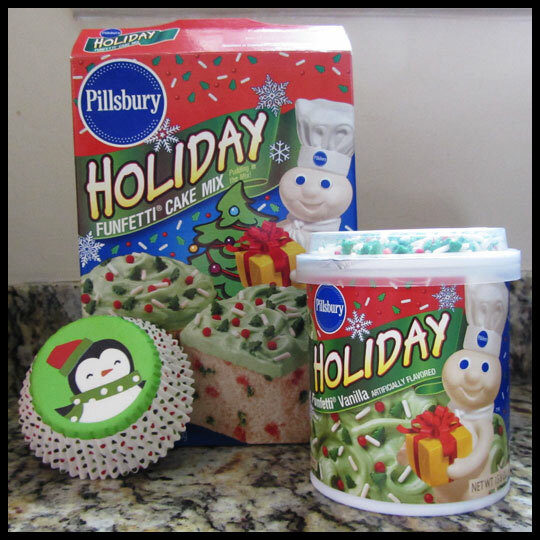 Then, I spotted Pillsbury‘s Holiday Funfetti cake mix and frosting! Being the “non-baker” that I am, I often look to box mixes to help me out, but I’m not sure why I get so excited about Funfetti cake. 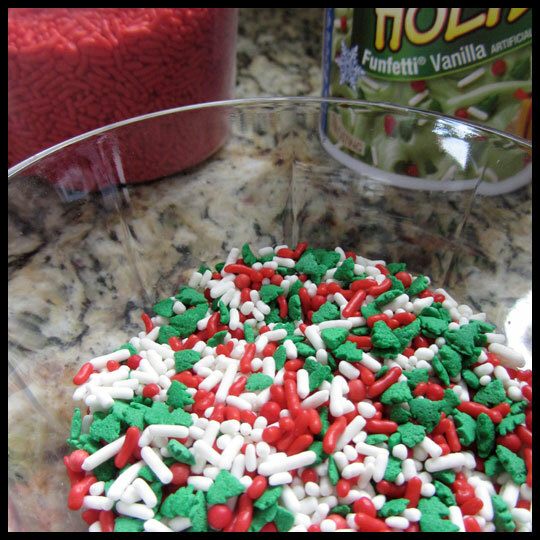 All you have to do is add sprinkles to the batter. It could be any box mix or recipe, but it doesn’t seem to matter. 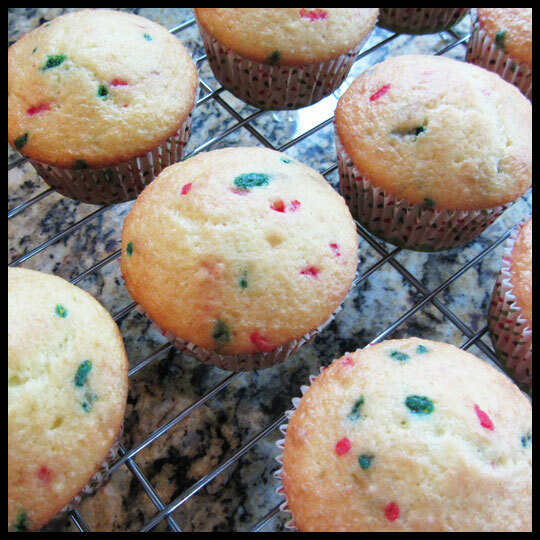 I love Funfetti. Just look at all those “fun” red a green specks in the cake. Do they add flavor? No. They are purely for our visual enjoyment. I was a little disapointed with two things though (regarding the Funfetti frosting). First, there weren’t nearly enough red sprinkles. Luckily I have a tub of them at home, so I just added my own. Second, the frosting was more of a minty green, and not the sage green that is on the packaging. I could have tried tweaking it with my own food coloring, but it didn’t seem so bad that it was worth messing with. 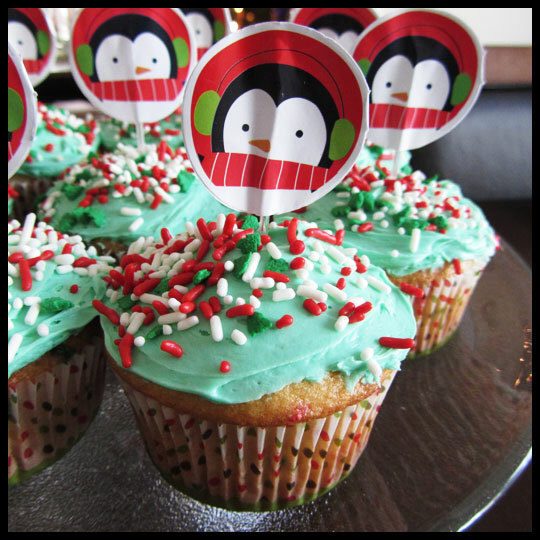 An army of festive penguin cupcakes.